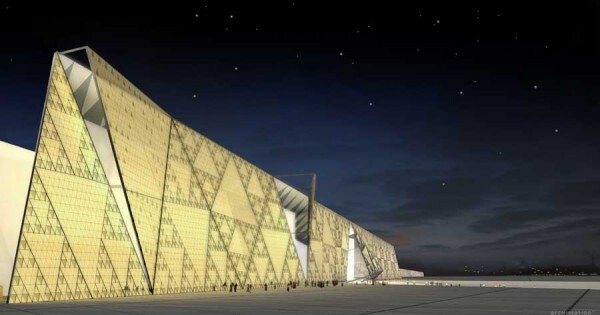 Exhibition galleries, storage centre, conference centre with 3D cinema, but also retail outlets, restaurants, and ancillary buildings: the new home of the royal mummies and other treasures of ancient Egypt is vast. So as not to disfigure the Giza Plateau, it has been built a small distance away, downhill from the pyramids of Khufu, Khafre and Menkaure. If its size and the complexity of its design match those of the pyramids, so too did the challenges associated with its construction. Among the peculiarities dreamed up by the architects, a huge folded cover slab: an elegant 33,000 m² articulated structure, consisting of cascading panels with not one identical square metre. Its dimensions, its complexity and its slopes represented a triple challenge for engineers. A way had to be found to produce these extraordinarily complex concrete structures with an extreme level of precision, so as to ensure the perfect alignment of the underside of the roof and its suspended ceilings. Forming the 14,630 m³ of concrete into the desired shape called for the use of complex formwork, supported by reinforced beams and slabs structures. The concrete itself was the subject of specific research. Lafarge, the French company cement and aggregates company, spent months testing different mixtures of white concrete to achieve the best compromise between functionality and a surface quality that will withstand the enormous stress level.